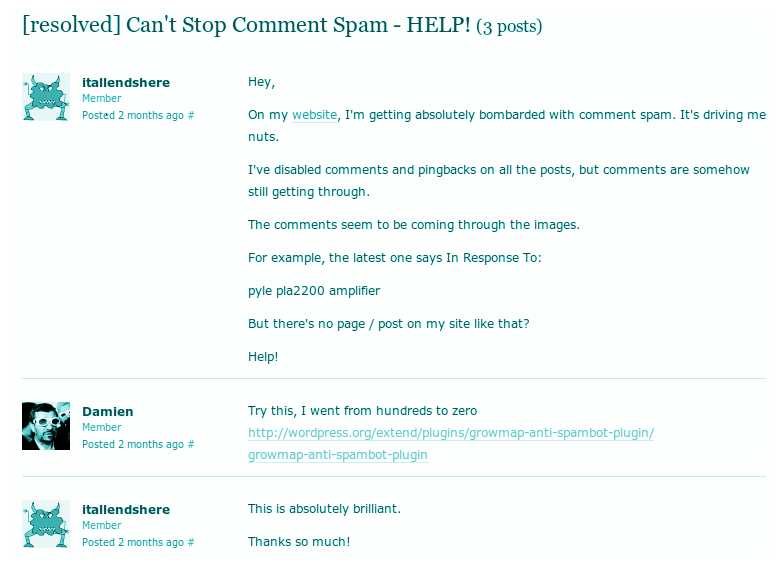 There are so many wonderful comments in the official WordPress plugin repository about our Akismet Alternative GrowMap Anti-SpamBot Plugin aka G.A.S.P. with great quotes in them that are difficult to get to so I am creating this post to link from the G.A.S.P. Tab here. This plugin exists because so many of my regular commentators have been flagged as spammers by Akismet that I stopped using it and started testing alternatives. Bad Behavior acted very badly – locking four Admins out of my GrowMap blog and requiring the efforts of three of the best WordPress experts to remove. In the first 48 hours of using a Captcha I had complaints from three regular commentators that it kept telling them they entered it wrong when they hadn’t. While clearing their cookies probably would have resolved that our blog readers do not know that! Andy Bailey, who created the blogger favorite plugin CommentLuv wrote this custom anti-spam solution based on an idea from Phil Hollows of FeedBlitz and improved upon based on input from Dazzlin Donna Fontenot. My thanks to you all. Now when I log into the blogs I manage – and I am using this plugin in over a dozen of them – instead of a sinking feeling I am overjoyed to only see 12-50 real comments instead of 1,000 spambot generated spammy junk that had to be manually reviewed to find the real comments buried among them. Feel free to comment on the GrowMap plugin page in the WordPress respository or in the comments here or on the plugin tab. We have used it in WordPress versions 3.0.1 down to 2.9.1 with no problems at all. I promised Andy that if he would write the plugin I would provide support so please contact me for support or if you have any questions. I am happy to assist. As far as I know, Andy never created a GASP for contact forms. Most of us use Contact Form 7 and I don’t get much if any spam from it. GASP blocks comment spam. it’s so good to see an alternative to akismet. I have 3 alternatives for commenting on my blogs and I have 0 comments – I tested the applications and it seems it simply looses comments – they’re not in spam, nowhere to be found. If you would share the links to the blogs I could test to see why your commenting is not working. Another good plugin to test, will be back to update on my findings. Thanks again. Akismet judge spam comments by user reviews and is not able to work as professionals, due to which many good comments are lost. G.A.S.P. would be a excellent solution for anti spam plugin. I forgot to rate GASP. I will do it now because I am totally satisfied. No more akismet for me. I will definitely download this and give it a try. Akismet doesn’t have the ability to keep track of what is a bad comment and what isn’t. It just goes by where webmasters send the comments to–either make them live, delete them or send them to Akismet hell and that’s not fair for anyone who doesn’t belong in that category. That’s why I refused to install it on my blog. saved me time and effort since I wanted to write the same for quite a time already! We welcome this plug-ins as Akismet is serious problem for all regular commentators. I found this site in search of a good anti-spam plugin, I will test it out. Hope it works as my websites are getting spammed more and more. Thanks guys! Getting all that spams is really a pain. I appreciate this informative post of getting rid of those spammer for sure! My spam went from 300 to 0 in just two days…Thats POWER! hmmm. It is a bit disconcerting to see that 90% of all comments on this page are really spam for all kinds of services and products. So either it GASP is not installed, or it does not work well, or you moderate too lightly. I rather have a plugin that refuse the comment if not a real name is used. This is a great idea to stop the mills from automating registrations and comments. The thoughts of the individual are alive. It is that you have introduced the competitor of Akismet. I have read on many blogs that GrowMap Anti-SpamBot Plugin is a good plug-in. I have my own blog site. i get everyday lots of spam comments in all of my blog post. thanks for the information about this plugin. it will try it in my blog site. Thank you for this information, I greatly appreciate it! Askimet is now off my blog. I missed Kimberly Castleberry’s WordPress Plugin Review last december- now I see that Askimet is old news! It’s all about your plugin now! Thank you for creating Growmap Anti-Spambot Plugin!! Kim and I collaborate as often as our busy schedules allow and I seek out her feedback on many topics such as Facebook and to get her input on Social Media and technical blogging questions. She is one of many who pool what we know to speed up what we can do. This plugin has been a true blessing to me and many other great bloggers including Business Coach Donna Fontenot and Justin Germino aka DragonBlogger who offers WordPress Services assisted early on with suggestions that made it even better. The more bloggers who use GASP instead of Akismet the more we can support each other and small businesses. For the past month I’ve noticed that my comments were going into the void. So I decided to filled up akismet’s form for false positives on its site, the good things though was within a day or two I received an email from them, and the problem had been fixed. I am glad for you that you got it fixed but you need to know that it probably won’t last for long. Akismet just told one of my commentators that using keywords in the name field will have you flagged for spamming – even if you only do that in blogs like this one that use KeywordLuv. As a drupal evangalist I don’t no these tools that well but the issues are the same. Thanks goodness for Mollom – the drupal equivalent. The posts if very informative! Thanks for sharing one. I myself experienced being spammed especially on my email accounts. I have changed the setting to my account in a way that it prevents spammers to get into but still not working pretty much like it. I would love to try this plugin tool if this can really solved my problem. Do I need to buy this application? I have heard so much about this plugin I had to come see about for myself. I do like the idea of requiring “human input” through the use of thr checkbox. i am definitely going to get it and try it first on a couple of my sites, then if all goes as everyone says I will impliment it on all my sites. And as someone said earlier: I also went from 1000 spam comments to ZERO in a matter of days. Truly awesome if you ask me. It’s very frustrating when you spend time reading a post and making a comment, only to find that the comment has disappeared into the ether so you then have to go thru the tedious process of contacting the blog owner who may or may not retrieve it. If Akismet is allowing spam while blocking and banning genuine comments, why do people continue to use it? Obviously because Worpress promote it. But as an example of how they deal with complaints, see: http://wordpress.org/support/topic/my-comments-on-other-wordpress-sites-are-not-showing. I don’t think they treat complaints seriosuly and I’m glad more people are using the GASP alternative. “With Akismet I had good comments slipping into spam. This was a problem, as I got so much spam it took me ages to fish through it, which was boring and time consuming. I now have time to check the spam folder for real comments, as there is so little spam! I’ve got a couple of WordPress blogs and I’ve been having problems with Askimet being too “sensitive” in flagging comments as spam. I’ll give G.A.S.P. a go and see if that works better. Akismet plugin is ok but what I noticed is that it put good comments as spam and opposite. The other thing was that to filter out those good comments from spam folder I really had to use much of my time and so stop doing it in certain point. Your plugin made a really huge difference. It stops all the robots generated comments and I like to see just 5 spam comments in spam folder instead of 100 before. I’d like to add that it does make a pretty nice dent in the amount of spam coming to your site. Of course, the human spammers still make it through, but just the reduction of automated software makes a huge difference! Manual spam is hundreds-thousands times more expensive, there will be no economic sense to hire manual spammers. Note that human solvers sweatshops do not directly interact with websites. Otherwise, it would not be such big and legitimate business and with such low prices. It is enough to prevent laundry attacks (redirection of captchas) by bots to 3d parties for human solving. So you want to say that Akismet is not good? Hmm, I use it for almost two years and I haven’t any problems, or I don’t remember. I know that sometimes, some of comments fall by the spam comment, one that should not have, but I’m sure that all plugins have one error. But I’ll try GASP, to see how is it. It is a great simple yet effective plugin. It is part of my standard installation for client’s sites. I agree that Akismet does classify some valid comments as spam. I am gonna give GASP a try and turn off Akismet to see how the spam control works. It sounds great. I will try it myself soon. THX. I myself just installed this plug-in like 15 minutes ago. I can’t wait to see my spam decrease. I currently have like 100 spam messages waiting for moderation. Thanks God, there is no need for me to use that plug-in as Akismet is enough to fight the spammers. I just feel sad that there are real comments that sometimes tagged as spams. You do realize that makes no sense, right? If you know that real comments are being blocked are you at least rescuing them? Wait until you get 100s or 1000s of spambot comments a day and it takes hours to wade through them all to rescue the real ones. THAT is why this plugin exists. It is FAR better than Akismet. Akismet is a horrible solution as I explain in a recent post where I used it as an example of a crowdsourcing failure. Many bloggers don’t mind Akismet putting real comments into spam or deleting them outright until it is THEIR comments that are blacklisted. There is a very high probability that your comments are being flagged as spam because you are using keywords and selling something. You should test that to find out by using the link in my post on How to Tell if Akismet Has YOU Flagged as a Spammer. Wow, thanks for the link. This is my first time to learn that issue in Akismet. Useful plug-in as it’s going to help us to keep away spammers from site. Excellent idea. You should have included mine as well, GASP is pretty sweet goods. I didn’t see one for you in the WordPress repository or I definitely would have included it – and had a hard time finding these! If you point me at any you have I’m happy to add it. Most people automatically use whatever they hear about most and since Automattic is behind both WordPress and Akismet most start out using it. As you can see from this post it has major drawbacks (and there are many other posts about Akismet with additional details). You might be interested in my posts about privacy and data mining and the one on Google I’ll put in CommentLuv. I’m off to check out your post on spyware. Thank you, Donace, for letting me know that you are someone who trusts Dennis’ recommendations. He is wiser than the average bear. Thanks for weighing in. I had hoped to compile the reviews already but there are an overwhelming number of them! If you end up writing one before I finish I’ll add you too – or any time afterward. I was one of the first to use it and have contributed to its evolution by beta testing it. I completely support the GASP plugin and use it on all 9 WordPress blogs I own or administrate. (I still get about 20-40 spam comments per day though) but these are from live humans abusing keywords and such, not sure how to solve this problem. I will be creating another page or post with reviews of GASP and linking to the blogs of those like you who have been supporting it from the start. I use the blacklist function built into WordPress to block comments from repeat human spammers. While there isn’t much we can do about first time spammers I feel that the three-steps in this post are the best anti-spam solution so far. I think you gotta strike a balance between getting rid of bots and not annoying your readers. In the end, I think a good anti spam system is almost impossible to make b/c it all depends on natural language processing and stuff. The best way to stop spammers is to have your readers register. Requiring your readers to register is also the best way to keep real people from commenting. Social media savvy serious bloggers who will comment and then share your content are busy people who are not going to take the time to register and look up their log-in information. We just leave. Trying to log in fails so frequently that most who bother to register are unlikely to get logged in again the next time they want to comment. They will just leave too. People like me are probably not your target audience because we focus on accomplishing real tasks rather than fantasy anything and most likely although we reach many, most of our followers are probably not wasting any time playing fantasy games either. The best way to stop spammers is to use the two plugins mentioned in this post and the blacklist function built into WordPress. This is a great idea and I know there is a lot of people looking for an alternative to askimet. I am sure some bloggers report people to askimet to try and nulify comptetition’s ability to boost their serps through blog commenting. You shouldn’t bite the hand that feeds you though. Between the vindictive people who report their competition to the clueless who think any comment they don’t like = spam, Akismet can not possibly work – unless they made major changes as I suggested in my crowd-sourcing post. Wow. I’m going to try it myself. I didn’t know you didn’t know about it already or I would have suggested it. I’m off to read your new post about the Google Farmer Panda update.